First Edition of the Master of Science in International Business (Foreign Trade, International Marketing, and Internationalisation), University Ouaga II (Burkina) and EENI School of Business. 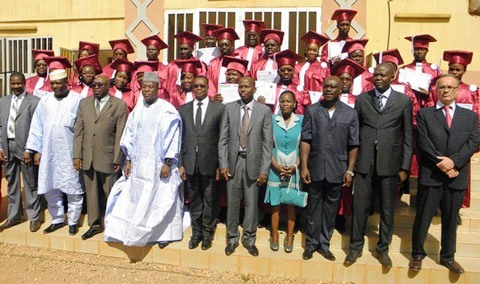 On December 15, 2012 took place the official ceremony of completion of the first edition of the Master of Science in International Business e-learning, taught jointly by the University Ouaga II and EENI School of Business. The act was presided by His Excellency the President of the Economic and Social Council of Burkina Faso (Mr Paramanga Ernest Yonli) the Minister of Public Work and Social Security (Mr Soungalo A. Ouattara), Minister of Secondary and Higher Education (Mr Moussa Ouattara), Director of the University Ouaga II and EENI's Director (Mr Pedro Nonell Torres). 13 Burkinabe students have achieved the Diploma of Professional Master of Science in International Business issued by the University Ouaga II and EENI School of Business. Currently, the second promotion of the master is being finalised, and the 3rd and 4th editions of the master have begun. We are especially proud of this project. Burkina Faso is one of the World's poorest countries, while EENI has offered Scholarships to the students of the Master; we know the economic effort that means for the students (and their families) to enrol in a master of this kind. We are proud that almost all students of this promotion of the Master are already working in positions related to foreign trade. 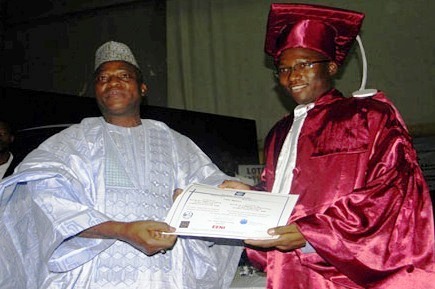 Following the success of this Master of Science in Burkina Faso, the University Ouaga II and EENI have agreed to expand the Master of Science in International Business (Foreign Trade, International Marketing, and Internationalisation) across the West African Economic and Monetary Union region in 2013. The ceremony also celebrated the completion of the Master of Science in “Management of NGO and Associations” of the University Ouaga II. We also wish to thanks to the Honorary Consul of Burkina Faso in Barcelona, Mr Joseph M ª Comalada Simon, for his invaluable collaboration. 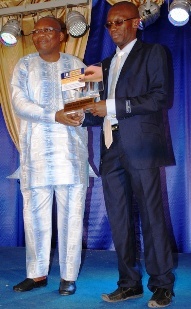 EENI has always supported the development of Africa, in 2004, we launched the first phase of the project “Africa Export” with the aim of offering scholarships to the African Students, with special emphasis on African Women and the development of courses on business and foreign trade in Africa. In 2007, we began the second phase of the project and we introduced the “Master of Science in International Trade and Business in Africa.” Currently, EENI has students in almost all African Countries. EENI offers his courses and masters in Africa in English, French, and Portuguese. EENI also has two African professors specialised in foreign trade and Business in Africa. PhD Geneviève Barro and PhD So Ousseni was the Co-Directors of the Master of Science in Burkina. Susana Fernandez (Director of International Relations of EENI) was the Co-Director of this Master by part of EENI. 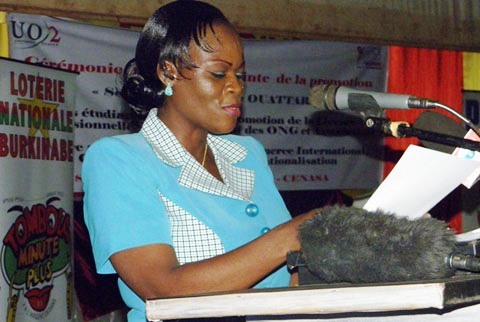 PhD Geneviève Barro, Director of the Master of Science in International Trade in Burkina. The University Ouaga II was inaugurated in 2008 in Ouagadougou (Burkina Faso) at the initiative of the Government of Burkina to meet strong demand for higher education in the African Country. Both the University of Ouagadougou and the University Ouga II are positioned as the second-largest university pole in the region of the Economic and Monetary Union of West Africa (WAEMU): Benin, Burkina Faso, Ivory Coast, Guinea-Bissau, Mali, Niger, Senegal, and Togo. The West African Economic and Monetary Union region has about eighty-two million people and share a common currency: The CFA Franc. EENI Business School & HA University is a European business school specialised in foreign trade, international business and global marketing with more than 4,000 students from hundred countries. EENI is a certified member of the International Commission on Distance Learning (ECOSOC United Nations). EENI Headquarters are in Spain. This press release in Burkina Faso Master Burkina Faso Master Burkina Mestrado.